Thirty-four years ago, the Vietnam War ended when Saigon fell on April 30. Little Saigon in Orange County, California is the largest Vietnamese community outside of Vietnam. There are now more than 11,000 Vietnamese-owned businesses in Orange County offering almost every kind of service and serving almost every kind of dish. 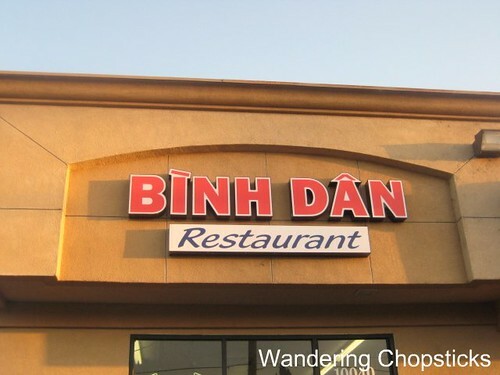 In a non-descript strip mall in Westminster lies Binh Dan Restaurant. The specialties at Binh Dan (Vietnamese for commoner) are mon nhau (Vietnamese for drink-friendly food) and de 7 mon (Vietnamese goat in 7 courses). Nothing fancy here. Basic working-class food. Goat can be an acquired taste for many people. 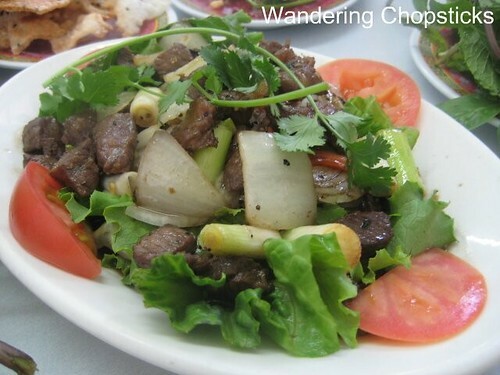 At Binh Dan, the goat is locally sourced, coming from the owners' father's farm in Riverside County. The cooks are known for removing the gamey taste from the meat. I've been curious to try this restaurant ever since reading Kirk of Mmm-yoso's visit. With Foodbuzz's 24 Meals, 24 Hours, 24 Posts to foot the bill, I invited a few of my more adventurous eating friends - kevinEats, Pepsi Monster, Danny of Kung Food Panda, and Aaron of Destination Eats, who specifically said he likes gamey meats. I told them the 7 courses of goat was on the menu, with perhaps a side order of de vu nuong (Vietnamese grilled goat breast/udder). What I hadn't counted on was Kevin's fine dining bias. "Is there a corkage fee?" Kevin asked, unimpressed with their selection of Heineken, Michelob, and Budweiser beers. So I called and asked, but the person who answered the phone kept insisting they had plenty of their own beers, and for only $2. Sigh. I know, but my friend wants to bring outside beer. I offered to pay. After a bit of back and forth, I was told $1 for corkage, but wasn't sure if, when we got there, outside drinks would be allowed. Sure enough they weren't, but the waiter nicely let us just this once, for free. I added extra at the end for corkage anyway. "I thought you took care of this?" Kevin asked. Duude! It's Little Saigon. There are no reservations. Corkage? What's that? And cash only please. That little technicality out of the way, what was more nerve-wracking were three sets of SLRs snapping away at the food. Geez! Haven't you guys heard of being discreet? And I specifically said no fancy cameras! Which they all swore they didn't remember me saying. I didn't want to get kicked out and we might not have been noticed in a larger restaurant, but this place is tiny. I mean tiiiny. I forgot to take a picture of the inside while it was empty, and didn't feel comfortable doing so when other customers came in. So imagine my apprehension. Fortunately, no one bothered us. I ordered two sets of 7 courses, which were $16.50 each, and grilled goat breast and de luc lac (Vietnamese "shaking" goat), think of Bo Luc Lac (Vietnamese Shaking Beef) but with goat. Frosty mugs for our beers. What's that you see at the bottom? My people. We are clever. 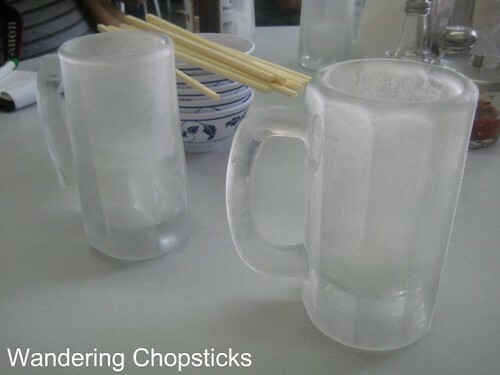 Sure we got a bucket of ice on the side, but these already had the ice frozen inside the mugs. Plates of basil, sawtooth, and cilantro, lemon and chili peppers. 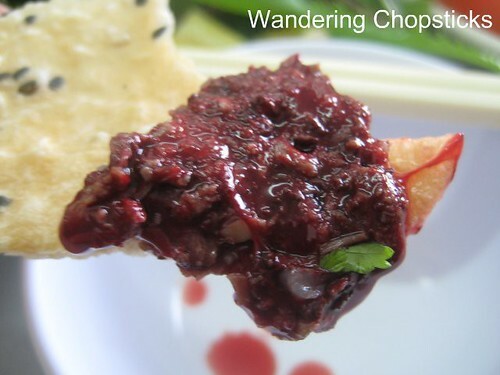 Tiet canh de (Vietnamese goat blood pudding). 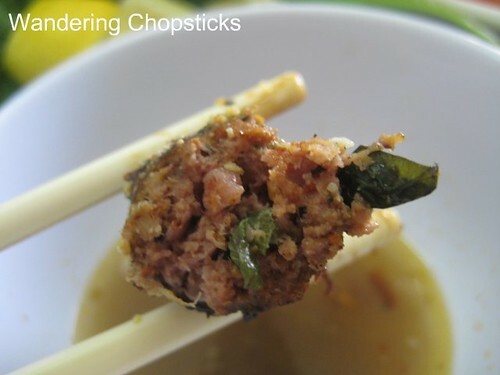 Oh man, remember when I wrote my 100 Vietnamese foods to try post and said I was too freaked out to eat it? 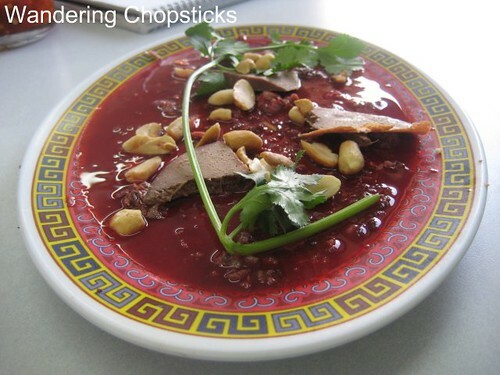 Tiet canh is chopped meat in congealed blood pudding with slices of liver and peanuts. It's so, well, bloody. But the main difference with my eating habits after having a food blog is that I'm game for anything. So I grabbed a piece of banh trang me (Vietnamese toasted sesame rice paper) and scooped out a portion of tiet canh. And it actually wasn't half-bad. Not something I'd crave, but nothing to fear. It just tasted like a softer version of blood sausage, sans casing. 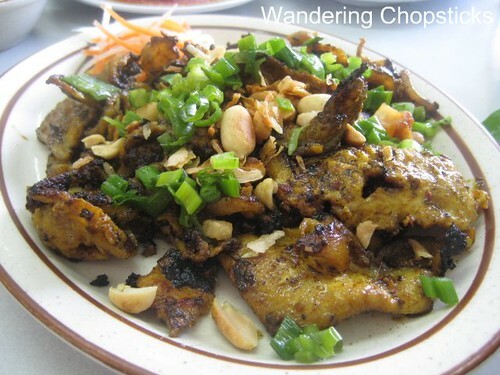 De xao lan (Vietnamese goat stir-fried with curry powder). Curry tends to pair well with goat to help disguise the gameyness. The meat wasn't gamey at all though, and a dry curry stir-fry was a very fragrant new-to-me method of cooking. The turmeric and cumin in Ca Ri Ni An Do (Vietnamese Indian Madras Curry Powder) were enhanced by the fresh cumin notes of ngo om (Vietnamese paddy herb). De nuong (Vietnamese grilled goat) and de nuong la lot mo chai (Vietnamese grilled goat with wild betel leaves in caul fat). The grilled goat with sesame seeds was excellent. Toasty and flavorful, with slight crispy/chewy parts from the skin. ...until I cut one in half and realized the betel leaves were on the inside. The caul fat helped give it a light sausage-like casing. And honestly, if I didn't know I was eating goat meat, I'd think I was eating Bo Nuong La Lot (Vietnamese Grilled Beef with Wild Betel Leaves). The wild betel leaves on the inside gave it a subtle hint of that lovely fragrance. I personally would have liked more, but that's because I love la lot. 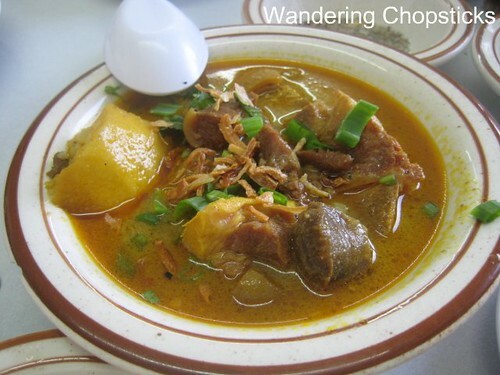 De ca ri (Vietnamese goat curry). Again, curry helps disguise gameyness. And again, it really wasn't needed. The curry was rich and flavorful. If you like Ca Ri Ga (Vietnamese Chicken Curry), you'll like this. 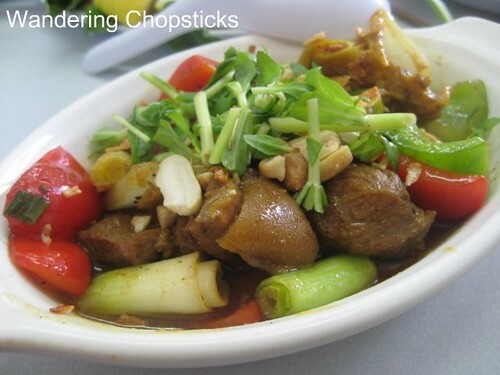 De nhua man (Vietnamese goat stew). I couldn't find a proper translation of this dish and the waiter only said it was a stew. I called my mom, who had no idea. She asked my dad, who said it meant prepared in the style of dog meat. Hmm. Well, I've never eaten dog meat so I have no idea how it's supposed to be served. The stew was tasty but I was hard-pressed to identify its flavors. It sort of reminded me of goat hot pot that I've eaten in Vietnam, but that was too long ago to recall. I think the strips were taro? 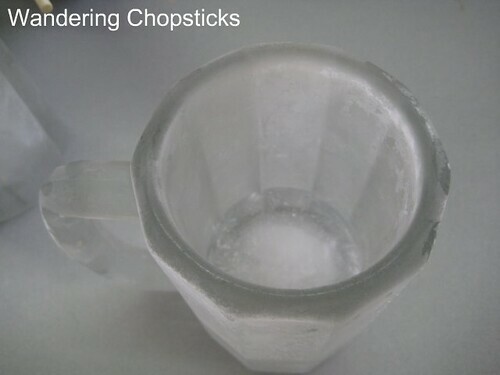 There was some tendon and more gelatinous cuts. I flipped through my copy of "Am Thuc Viet Nam (Vietnamese Gastronomy Guidebook)," which described a dog dish with saffron and galangal, but I'm not sure that's correct either since the dish described in the book was rather elaborate. None of the 10 goat dishes listed in the book gave me any clue either. Anyone know? 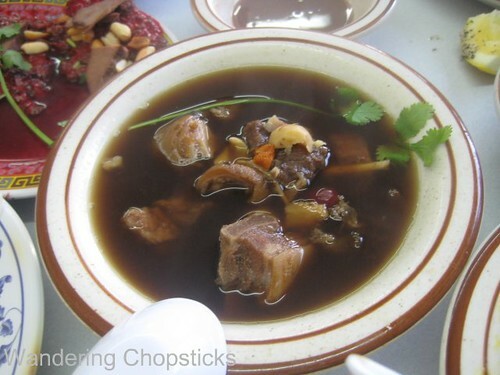 De tiem thuoc bac (Vietnamese goat with Chinese medicinal herbs). Tender spare rib pieces. This tasted more of the Chinese medicine than anything else. On the table was also a plate of rice noodles, Mam Ruoc (Vietnamese Fermented Shrimp Paste), and Nuoc Mam Cham (Vietnamese Fish Dipping Sauce) for dipping. That's the last of the seven courses set. 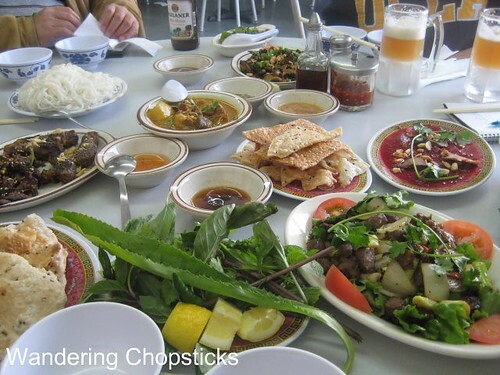 Usually with Vietnamese seven courses of beef, one order is more than enough for two people. The portions here were pretty small. Everything pictured above was two orders. In this case, one order really is meant for one person. I also ordered Vietnamese "shaking" goat for $8.50. I wanted to try the goat meat without any other type of special preparation. This came out similar to cubed steak, as a salad with a bowl of salt, ground black pepper, and lemon. Compared to the other dishes, especially the grilled goat with sesame seeds and wild betel leaf, I found the cubed goat rather bland. Now we get the special menu item that was written on the wall. 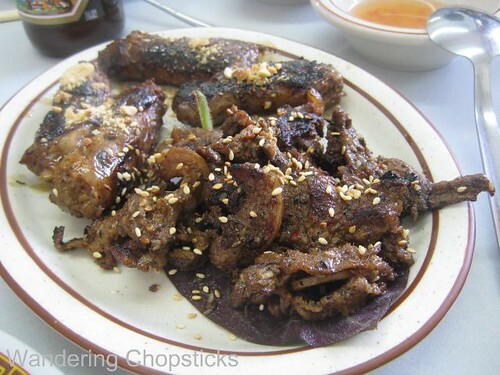 De vu nuong (Vietnamese grilled goat breast/udder) for $8.95. It was lightly seasoned with curry, but that couldn't disguise its slight gameyness. I was actually surprised because this was really the only dish that was gamey. The meat was tougher, more chewy. Other than that, it wasn't nearly as exotic as the sound of eating goat udders would make you think. My favorite goat dishes were the stir-fry, grilled with sesame seeds, grilled with wild betel leaf, curry, and stew. If you've been too intimidated to try goat meat, I would highly recommend Binh Dan because with the exception of the goat udders, the meat was not gamey at all. We probably could have eaten more, but I was still full from the 32-oz freshly squeezed sugarcane juice I got at C&C Express (C&C Food Co.) for only $3.50! We also started talking of other Little Saigon eateries and decided to have a second dinner at Brodard Restaurant for their Nem Nuong Cuon (Vietnamese Grilled Pork Patty Salad Rolls) and Banh Tom (Vietnamese Shrimp and Yam Fritters). Thanks again Foodbuzz for sponsoring this dinner and for allowing me to showcase Vietnamese cuisine. Who else ate at Binh Dan Restaurant? Kirk of Mmm-yoso's original post inspired this visit. My Little Saigon post gives an overview of Vietnamese American history and Little Saigon. 1 year ago today, Celery, Blue Cheese, and Walnut Salad. 2 years ago today, fava beans were in season. Remember to double-shell them for Bissara (Morroccan Fava Bean Dip) and Fava Bean and Chickpea Salad. Wow, that feast looks delicious. What is that long sawtooth leaf? Is that a type of lettuce? I like this line, "Duude! It's Little Saigon. There are no reservations. Corkage fee? What's that? And cash only please." - the first time I visited our Vietnamese grocery store I pulled out a CC to pay and was quickly admonished, and I quote, "No, no. We are Vietnamese. Only cash or check, no visa." Luckily I had a check book in the car. The funny thing is that in Viet Nam, CCs can be used many places that are actual stores as opposed to market stalls or street vendors. Even the store way out in rural Quang Nam province took my visa. What a feast! I'm curious...is the goat meat tough. You mention it in only one of the dishes and I was curious as to the rest. goat prepared in the style of dog, huh? I bet you got a kick out of that response. You are much braver than I am! I honestly don't think I could try the blood dish. Blood sausage is fine, but visually this dish doesn't look very appealing. But I would try the udders as they look very good. For some reason they remind me visually of satay, because they're the same color. For a gamey dish like that, I think a squeeze of lime might cut the gaminess. 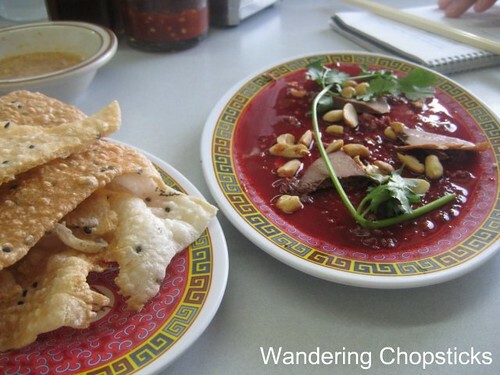 Thanks for sharing this snapshot of Vietnamese food. YAY for De! Tiet canh? I dunno about that one, WC. the dish that you were confused with is called Gia Cay(Fake Dog). Back in Vietnam that is how they would prepare dogs. It is cooked in galangal, lemon grass, mam ruoc, fermented rice. omg udders!!!!! i gtg just to try it. do you know of any places that might have charbroiled beef udders by any chance? Hmmmmmmm yummy!!!!! 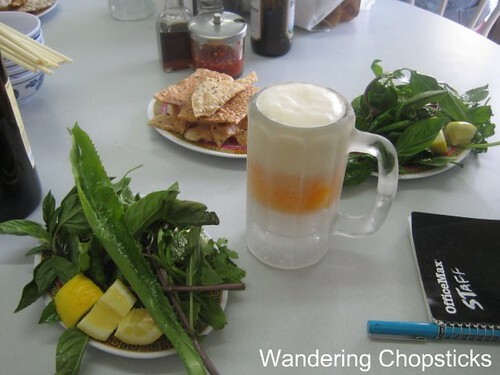 I've been following ur blog for about a year now & it always make me go nuts looking @ all the Vietnamese food. I love it! 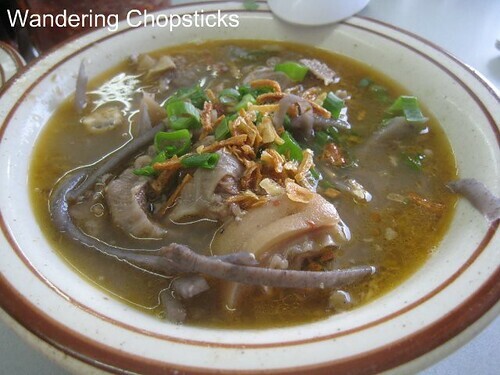 That photo of the Tiet Canh made my tummy turn. Taking photos of a meal is always my least favorite part, especially when you're in a small place like this. I'm glad they let you stay! Great look into authentic, good food. This is a great way to get friends involved and let them have a taste of something different. Love your 24 post! i am loving them so far. I agree, that definitely is a goat feast! And I think I am going to have to follow their lead and just freeze the ice on the bottom of the mug, to keep beer cold. As for the la lot, I actually prefer the betel leaf on the outside, because I think it has a crispy and more pungent flavor, but I don't have experience with the goat and betel leaf combo. I love this 24 post, it is a great idea! I wish I had some tiet canh. I want to try that stir fry! So you'll go again with me, right?? I promise not to bug you about corkage fees like Kevin did!! You've never seen sawtooth leaf served with pho? It tastes a bit like cilantro, but stronger. The herb platters at the pho restaurants in SoCal always come with both basil and sawtooth. All the dishes were really tender. Just the udder was the exception. Yeah, I wasn't expecting that kind of response. I always shied away from the blood dish before, figured what the hey, and took a bite. The udders did look like satay and I should have thought of squeezing some lime. You eat field rats but not blood? Haha. I'll keep that in mind lady! There actually was gia cay on the menu, separate from the de nhua man. The dog dish I was referring to in my book actually had a more detailed description -- wrapped in lotus leaves, baked in clay, etc. I didn't taste any mam ruoc nor lemongrass in the de nhua man so I figured it wasn't the same as gia cay. I've never heard of eating beef udders. I keep thinking of where the milk comes from, which I guess is the same as the goat, but couldn't imagine eating that! Haha. Too bloody for you? I try to be quick so people can eat, but when eating with a bunch of bloggers, we all take turns with photos before passing the dish along. Thanks. I'm glad my friends were adventurous. I've heard the VNese food in HK is very Cantonese-ized so I guess not authentic? When I was in Australia, the food was pretty good. That ghetto ice in the mugs is pretty dang clever! I wanted more la lot too, but I guess it might overpower the goat? I don't like gamey lamb. I only like lamb chops from Fogo de Chao specifically because they don't make it gamey. Thanks for coming out. We'll have to go down to Little Saigon again for some bun bo Hue. Hi WC - Looks great.....man am I sorry I missed this! I wish you had been there! It would have been so much fun with you. But you had way more exciting adventures instead. You missed their best dish. They serve a clam dish that is one of the best things I have ever eaten. It is baby clams stir fried with cilantro, peanuts, hot peppers and some other goodies. It is served with Lime and those sesame crackers. OMG best dish ever! yeah, i'm glad i went on my date instead! Haven't had the good fortune to try a 7-course beef or goat dinner, so this is much welcome. Goodness, I think I'm still a tad freaked out by the blood. I'll probably be more inclined to try it when it's already that cooked blood colour (darkish), not looking fresh like that! There's other dishes I wanted to try, but saved this post just for the goat dishes. Ha! Wish you had come!